BMW is showing off the CS Concept car — which may hearken a new high-end sports flagship — at the Shanghai auto show this week. It sports the latest refinements of head designer Chris Bangle's "flame surfacing" aesthetic, with more complex planar transitions and swage lines. We'll get more on the potential new "8-Series" from Shanghai as it comes. 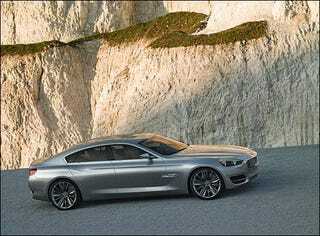 Over the Back Fence: A New BMW 8-Series?